Brig. Gen. E. John "Dragon" Teichert, 412th Test Wing commander,and to LACAS President Mike VanKirk, explain to the community how the Edwards/LACAS partnership will work. With a slap on the table and an emphatic “This is happening!” Brig. 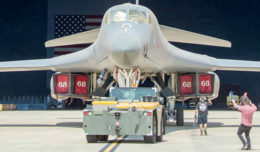 Gen. E. John “Dragon” Teichert, 412th Test Wing commander, made official the partnership between Edwards Air Force Base and the Los Angeles County Air Show, Inc. board of directors, which will bring a major STEM Expo to the Antelope Valley Fair in 2019 and two air shows to the Valley in 2020. As announced last October, the LACAS board and Edwards’ senior leadership continue to work toward solidifying a formal, multi-year partnership to conduct air shows within “Aerospace Valley.” This unique partnership paves the way to resume air shows at Edwards AFB. The last public air show on the base was in 2009. With Edwards’ long history of on-site air shows, and the recent establishment of the popular and successful Los Angeles County Air Show at Lancaster’s General William J. Fox Air Field, the question for leaders on base and those serving on the civilian show committee became, “How can we work together to do the show? 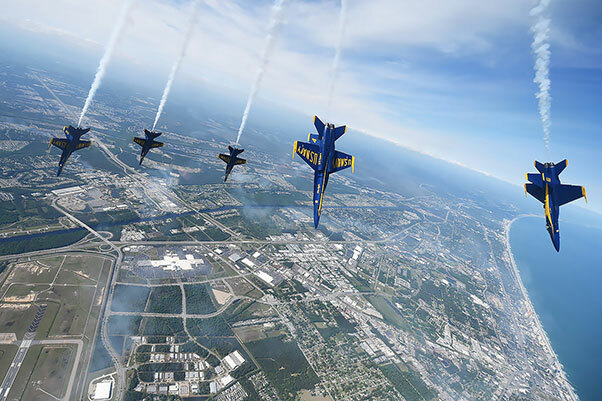 The previously announced October 2019 air show dates for the LACAS event have been moved to March 2020, in order to accommodate the U.S. Navy Blue Angels flight demonstration team. 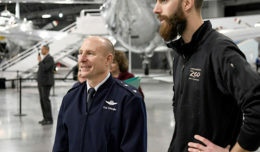 The year 2020 will feature “doubleheader” events, with air shows scheduled for March 2020 at General William J. Fox Air Field, and October 2020 at Edwards Air Force Base. March 21-22, 2020, the U.S. Navy;s Blue Angels will be the headliner at the LA County Air Show. The air show will be the kick-off show for the Blue Angels’ 2020 season. – Oct. 10-11, 2020, at Edwards Air Force Base, Calif., featuring the U.S. Air Force Thunderbirds. – Oct. 14-16, 2022, at Edwards Air Force Base. 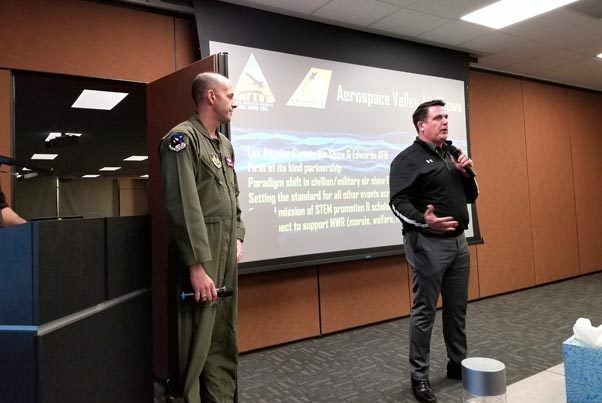 “Team Edwards is very excited to move forward with our LACAS partners to bring an air show back to Edwards Air Force Base, ‘the center of the aerospace testing universe,'” said Teichert. “Our unique community partnership will establish a one-of-a-kind, world-class Aerospace Valley Air Show that will showcase this amazing location as the primary place on the planet for aerospace expertise, innovation and partnerships. It will also provide an incredible opportunity to inspire, encourage and educate adults and children alike, while demonstrating what we at Edwards provide to the warfighter. We are proud to be a key part of the air show and to work with the superb team at the LACAS. In 2019, LACAS will host key community events, including a large, interactive Aerospace Valley STEM exhibition at the Antelope Valley Fair, Aug. 16-25. “Our commitment to inspire and connect our local youth to STEM has not wavered. In 2019, along with many of our air show partners, we will host an impressive, interactive Aerospace Valley STEM event that is second to none at this year’s Antelope Valley Fair. This will be a great way to engage both young and seasoned air show fans. Having the opportunity to have an impressive footprint at an iconic event like the AV Fair is invaluable to raise awareness for our future shows, as we gear up for an exciting doubleheader air show year in 2020,” VanKirk said. For updates and information, visit http://lacountyairshow.com.